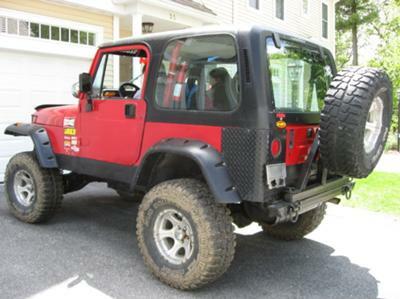 I started of with a stock 1994 Jeep Wrangler, stripped it down, sold everything and started adding from there. I drive it daily to school but tear up the trails on the weekends. I love my Jeep and there is nothing I would change about it. There is very little that is stock on this monster. Larry's Comment: She's a beauty Erik. Thanks for sharing. Your YJ sure is sweet looking. I like it. It's even in the right color, red! !